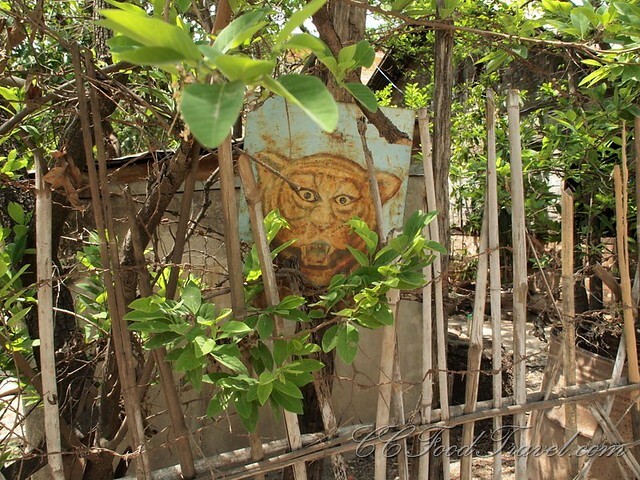 The Bagan Tiger leaps to life when an intruder infiltrates its boundary! 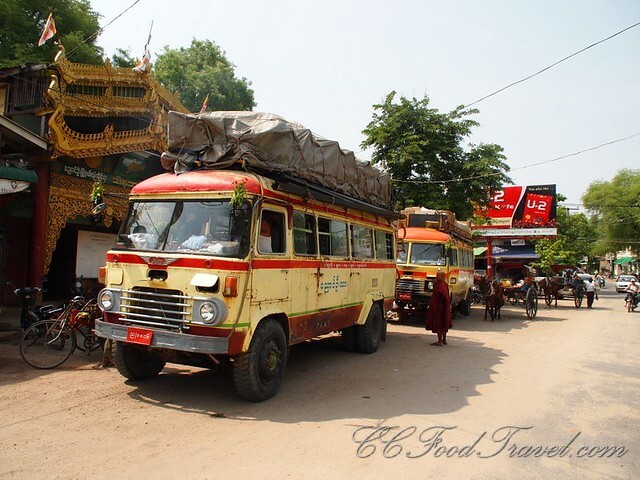 We arrived in Nyaung U (Nyaung Oo) near Bagan past midnight in a very dimly lit bus station together with another group of 3 travelers who were from North America. The aircond bus from Yangon was reasonably comfortable – comfortable meaning we were given toiletries, a large bottle of mineral water and a dog bone shaped pillow that was over stuffed with foam – they meant well I suppose, but it ended up being a little too hard to sleep on. The aircond worked magically on this bus. We would soon find out much later, that this bus would in fact be the best one we rode on, this entire trip. 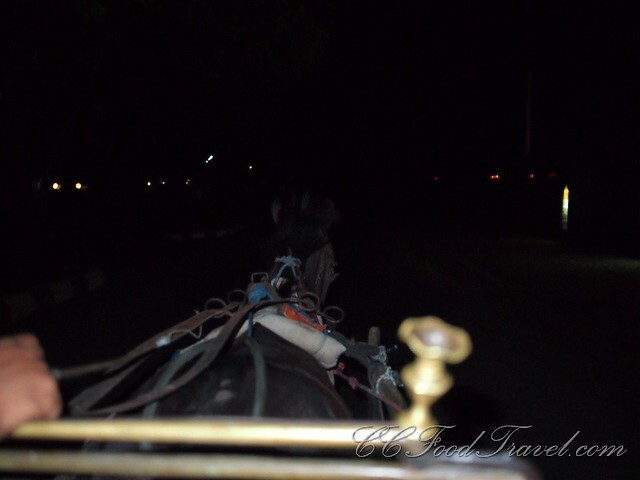 Upon alighting, horse cart drivers casually approached us for a USD1 ride into the old town of Ngaung U. They were well behaved and we didn’t feel intimidated unlike most other destinations. With little electricity available in Myanmar and as we entered a sleeping town, the only sound that could be heard was the plodding of our horse’s hoofs on the sandy roads in the dark. Without having found our bearings yet in the town, and no pre-booked accommodation, we knocked on several guesthouses to checkout the offerings. Eventually we settled for an air conditioned lodging, Eden Hotel, because it was simply too hot to sleep without it. 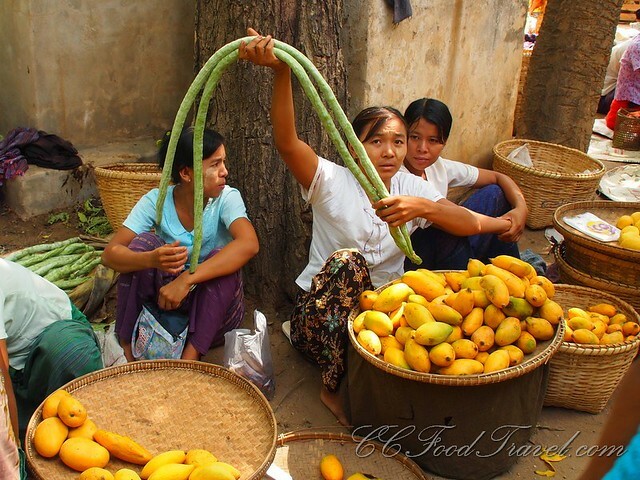 As a general guide, budget accommodations in Bagan area start from about USD12 per night during the low season. Obviously, the more you pay, the better the quality but even then, the average accommodations are still a far cry from mediocre ones available in Malaysia and Thailand. We choose to pay a little more for the added comfort. After settling in to our room, we discovered the aircond unit was spewing hot air. The antique aircond was out of freon! Exhausted, we endured the warmth and slept till daylight appeared before requesting to change rooms. 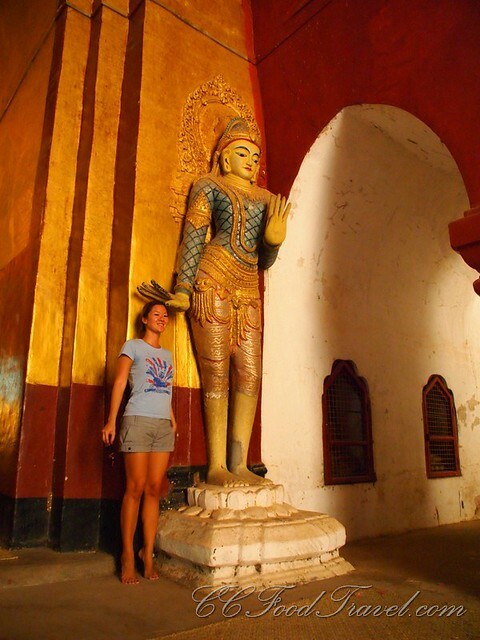 When visiting Bagan, the area is divided into Nyaung U, Old Bagan and New Bagan. The temples are located in both the old and new sections. 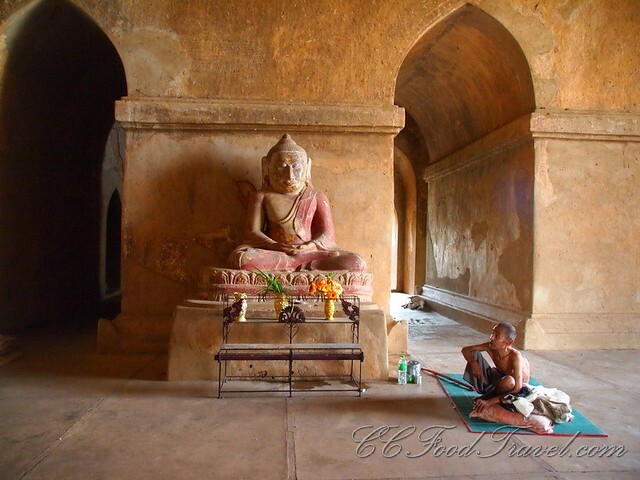 There are additional entrance fees to enter Old Bagan. Nyaung U where we stayed is the main trading area. 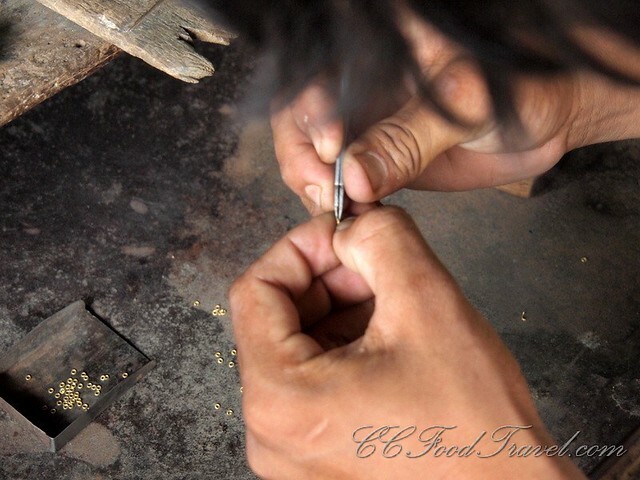 One of the first things that most travelers would do is to visit the market which, just like anywhere else in Myanmar, is a hive of activity throughout the day. For centuries, so many majestic temples and buddhas have been built with the contributions from the Burmese kings and citizens. 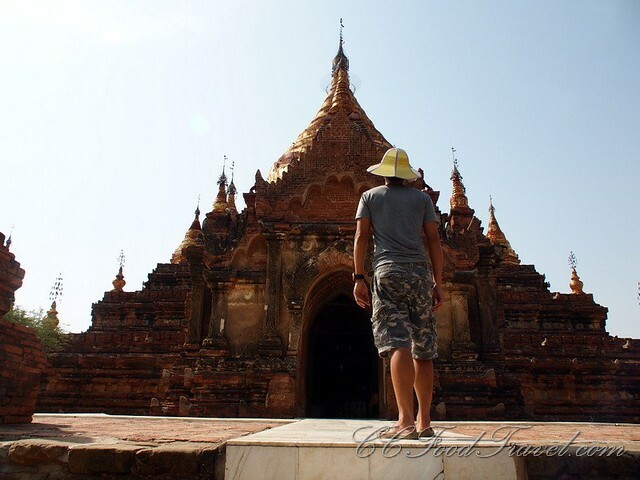 There are hundreds of temples around Bagan. Many are in ruins, some still sturdy and others in restoration. 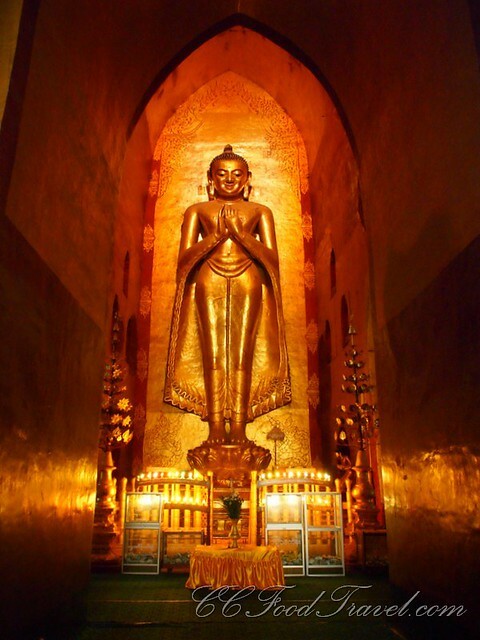 To see the numerous ancient and newer temples which puts Bagan on the tourist trail, you have 3 choices. You rent a bicycle or motorcyle which is the most affordable but will leave you sunburnt, you hire a horse cart which is apparently the socially responsible way to go, or you hire an aircond taxi like we did. 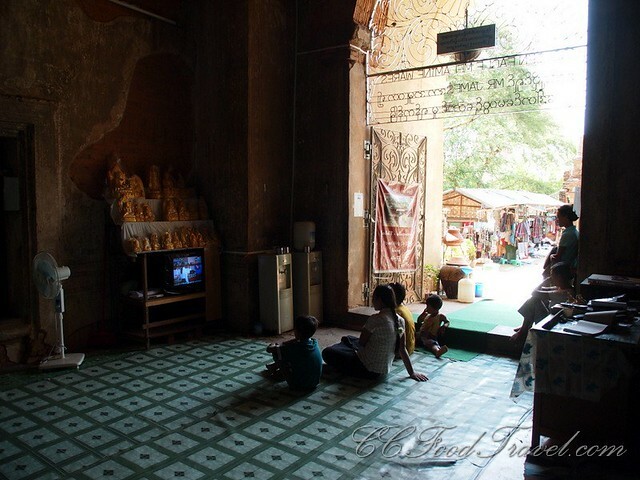 The blistering heat was just too much to enjoy a fun day out at the temples on a horse cart. It was the best decision made as the temperatures rose to unbelievable levels by mid day. There is a fourth choice with a hot air balloon ride over the temples but this comes at a premium which we didn’t want to splurge on plus it wasn’t in season. We spent the whole day out on the temple trail. Looking back upon the huge collection of images we took, we could not figure out to which buddha is related to which temple. Curating the images would take too long so we’ve decided to just uploaded a some of them onto flickr. Here are some interesting images of that hot day out..
Young souvenir sellers approach you at popular temples. Most of them strike up friendly conversations to breakdown barriers, often sharing historical, religious and cultural information before launching into their sales pitch. None of them were ever rude. You do feel the urge to give them something or purchase an item for their troubles. This was one of our very sweet, friendly and extremely persistent sales girl waving George Orwell’s Burmese Days as we left. 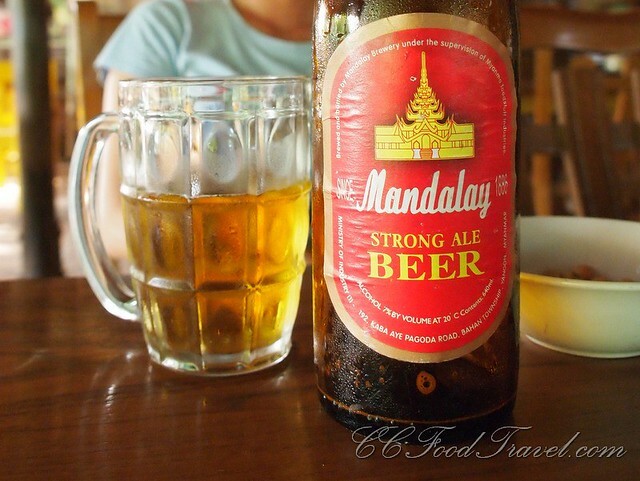 At Bagan, we discovered Mandalay Beer which happens to be the most awesome beer in Myanmar and quite possibly amongst the best tasting lager in South East Asia. There are 2 versions; red and green. Choose red not for its exciting Ferrari color or the 7% alcohol volume but because it has a great taste and is smooth on the palate – absolutely refreshing and invigorating especially in this 40 something Celsius heat! 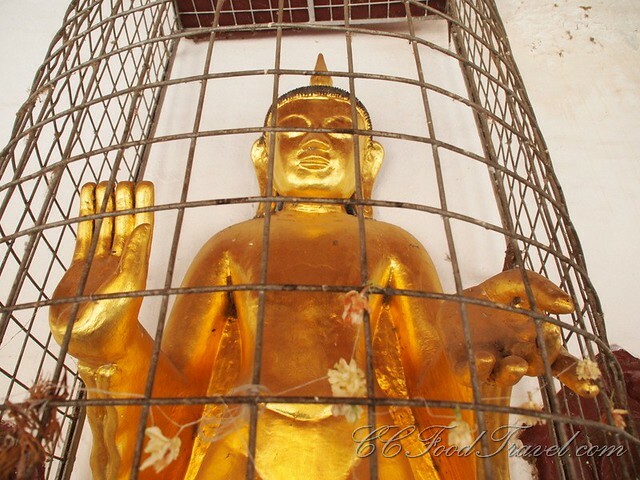 Looking at this image now gets me pining for a tall cold glass of Mandalay Beer. It might have been the heat but all the local beers in Myanmar tasted fresh – on the tap or in the bottle – and held a good fizz that really recharged us. In the evening we wandered into a Nepalese restaurant. 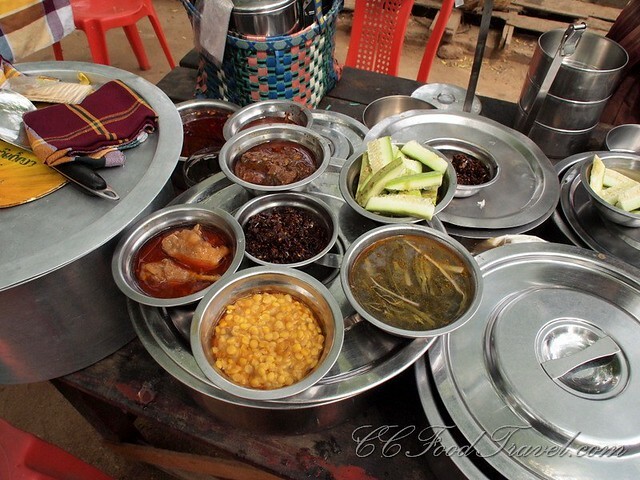 All the food was freshly made which also meant we had to wait for awhile for the food to arrive. We ordered 2 glasses of rum mixed with freshly squeezed lime and ginger cocktail. Refreshing, and very lethal. Our heads was spinning by the time our momos and chapatis arrived. 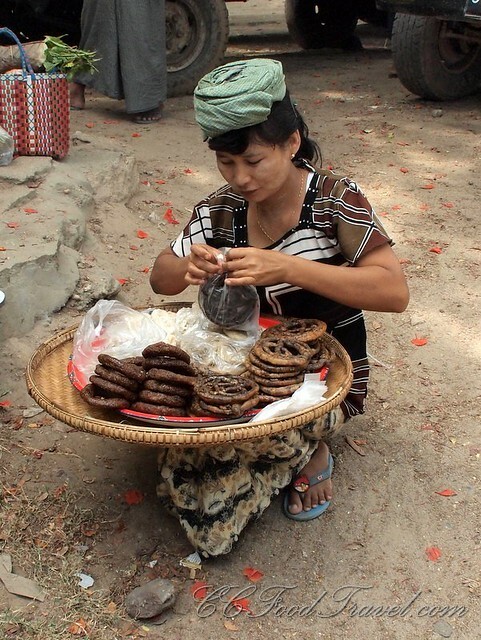 Food in Myanmar tends to be too salty so remember to always request for less salt. Needless to say, our orders came far too salty albeit flavorful. 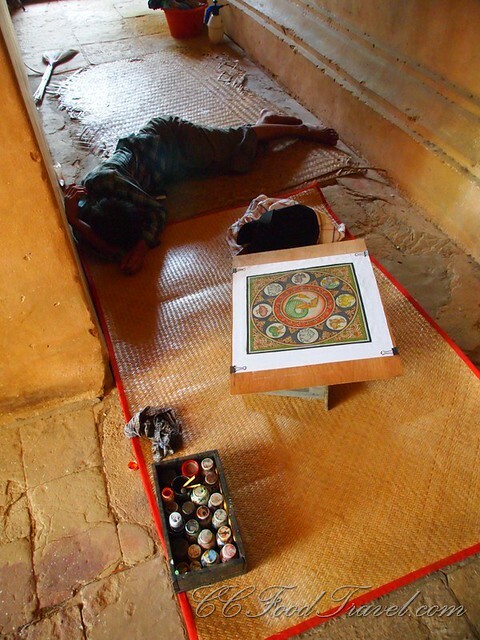 With more time in Bagan, you can head up to the hills of Mount Popa for a respite from the heat or shop for lacquerware in New Bagan. We skipped it due to limited travel time. 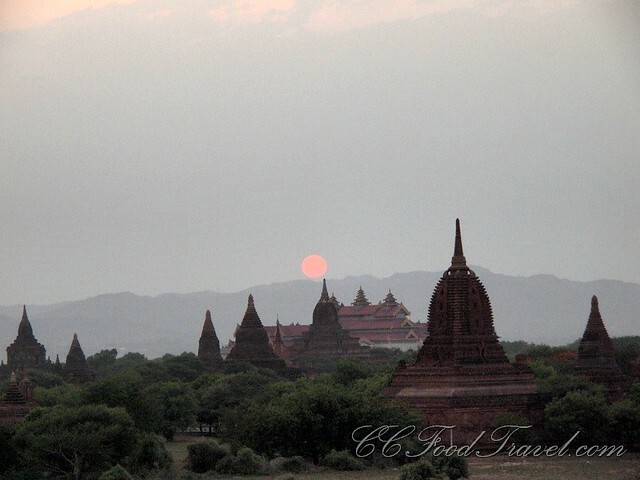 Our final event here and one which should be etched in our memories forever, as how we will remember Bagan.. a perfectly round red sun, setting over undulating terrain, peppered with the tips of stupas. That day, we managed to catch a glimpse of the red sun at Shwesandaw Temple and we were happy… as were the rest of the travellers around us. There are other viewing places where you can admire the setting sun. To find out, ask the locals or your transport provider. this is how we will remember Bagan.. 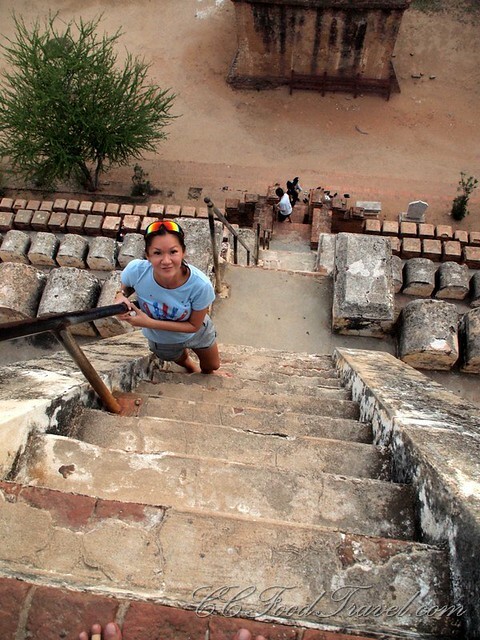 Climbing the steep stairs at the Shwesandaw Paya replaces her step aerobics sessions back home. At the bottom, the souvenir peddlers await our return. “Hi, Where are you from?… You see now, you buy later,ok?”, a popular initiation tactic by souvenir peddlers as you enter the sunset temple. It is sales pitch to receive a verbal agreement in hopes you will keep your word to purchase from them upon descending. There is no evading them as they track you on any of the four stair exits of the temple. They take rejection well though. For title and descriptions of images, click on any image to go to Flickr. If you liked this story, please kindly LIKE or FB too, cheers! Wow- beautiful pictures – I must visit !!! Did I miss the press release? Is it Myanmar week or what? I hadn’t seen any bloggers posting about this country in ages and now everyone is. Great photos! LOL, no there’s no press release. Just good old fashioned travel. Must be the fact that with the new ruling party, things are set to change. Hence the rush to see Myanmar before it modernizes. And you know it’s gonna happen before you can sneeze. LOL, it looks worse than in it is Tom! Not really that steep. I think Siem reap temples were steeper! 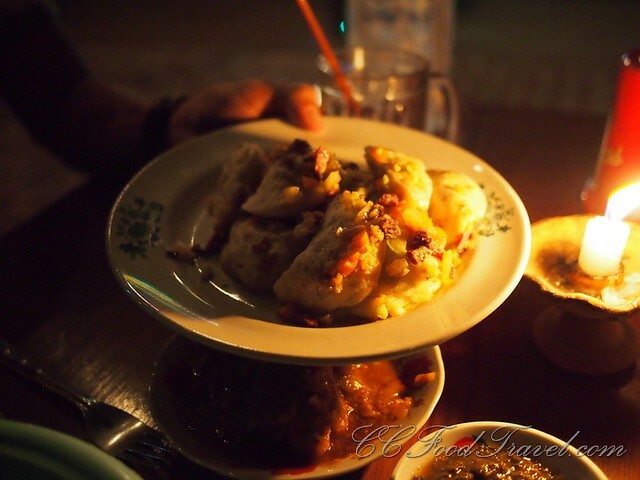 Food is generally cheap and tasty in Myanmar. We had no complaints! What an epic post, with great pictures. Myanmar looks amazing. thanks Ted! I was a great trip.. needed more time though.. gonna do north burma next!